A coalition calling itself “Not On The Guest List” organized a march on the Democratic National Convention [Chicago 1996] in solidarity with domestic political prisoners. Participants included Vermonter David Dillinger (Chicago 7) and Dennis Banks (American Indian Movement). The march was supported by a several hundred strong Black Bloc [largely organized by the Love & Rage Revolutionary Anarchist Federation]. The procession of protesters quickly strayed from its approved parade route so as to pass directly through the heart of a Chicago housing project. There it picked up hundreds of local supporters. Upon entering the “security zone” surrounding the United Center (site of the DNC) the protesters were met with hundreds of police (pedestrian and mounted) which blocked their entrance to the convention grounds. Thousands of police in riot gear were warehoused just blocks away. 48 hours later law enforcement illegally raided the Counter Convention (in retaliation?). Throughout the day police swept the city and made close to 20 arrests of suspected activists and leftwing sympathizers. Three people had to be hospitalized as a result of this police crackdown on freedom of expression. A law suit is presently  being organized against the City of Chicago. This article was first published in the Fifth Column Press, Marlboro VT 1996. Fifth Column Press was briefly the leftist publication of a group called The Liberation Movement which I, David Van Deusen, was a member of while attending three semesters at Marlboro College, Vermont (1996-1997). Fellow members/participants of the Liberation Movement included, among others, David Croken, Tino F., Katie S., Ariane B., and Parisa “Dove” Norouzi, (who went on to co-found Empower DC). 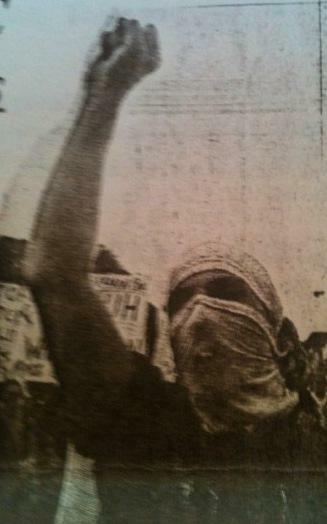 The march depicted in this article was the first where I masked up. I marched in these rallies with my cousin Chris P. who is now an IBEW Union Steward. Truth be told, during a later day in the protests, myself and Chris P. ran down an uncle, P.B. who was in town as a Democrat to actually attend the DNC. For one night we called a political family truce; P.B skipped out on the convention, and Chris and I skipped out on the protests. Together we instead took part in cold beer and hotdogs at a White Sox game. America’s pastime aside, 20 years later I continue to see these days of action, no matter the small scale, as the direct predecessor of Seattle and A16 (if nothing else on a personal level).